The Michael J. Coles College of Business at Kennesaw State University was founded in 1983 and is accredited by the Association to Advance Collegiate Schools of Business (AACSB). Today, students at Coles may earn eight degrees: BBA, MAcc, MSIS, MSHMI, WebMBA, Executive MBA, MBA (evening/part-time), and Ph.D. The Michael J. Coles College of Business main campus, housed at Kennesaw State University, is located in Kennesaw, Georgia, approximately 30 minutes north of downtown Atlanta and the Hartsfield-Jackson Atlanta International Airport. The main campus offers the evening MBA and Executive MBA programs, Ph.D. in business, Executive Education programs as well as undergraduate business programs. 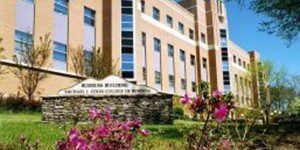 Classes for the Ph.D, Executive MBA and MAcc programs are exclusively conducted at the KSU Center near the main campus of Kennesaw State University. Evening MBA students, however, have several options for classes including the KSU Center, The Cobb Galleria Centre located about 10 miles south of the main campus and the new City Springs Complex located in Sandy Springs about 18 miles southeast of the main campus. Pending SACSCOC approval, we anticipate launching the Sandy Springs MBA classes fall 2019. The KSU Center is the primary home for graduate level and executive education business studies at the Coles College of Business. Coles students are taught in executive-style classrooms and have access to a wide range of on-line and on campus resources. Coles has over 160 full-time faculty members who teach courses across seven academic departments including accounting, economics, finance, quantitative analysis, information systems, management and entrepreneurship, and marketing & professional sales. The faculty use real-world expertise and research experience to convey business knowledge to Coles students. The Michael J. Coles College of Business at Kennesaw State University has approximately 600 students enrolled in the various graduate business programs. Another 6,000 students are enrolled in various undergraduate business related programs. The Michael J. Coles College of Business offers the evening/part-time MBA in Kennesaw, the Galleria, and in Sandy Springs (pending SACSCOC approval). The College also offers an Executive MBA program, a WebMBA program and multiple dual degree MBA programs.